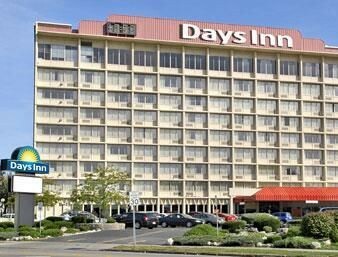 Property Location With a stay at Days Inn Niagara At The Falls in Niagara Falls, you&apos;ll be minutes from Niagara Wax Museum of History and Daredevil Museum of Niagara Falls. This hotel is close to American Falls and Bridal Veil Falls.Rooms Make yourself at home in one of the 168 air-conditioned guestrooms. Complimentary wireless Internet access keeps you connected, and cable programming is available for your entertainment. Conveniences include phones, as well as desks and coffee/tea makers.Rec, Spa, Premium Amenities Be sure to enjoy recreational amenities, including an indoor pool, a sauna, and a fitness center. This hotel also features an arcade/game room and shopping on site.Dining Enjoy a satisfying meal at a restaurant serving guests of Days Inn Niagara At The Falls. Quench your thirst with your favorite drink at a bar/lounge.Business, Other Amenities Featured amenities include a business center, complimentary newspapers in the lobby, and dry cleaning/laundry services. Self parking (subject to charges) is available onsite.